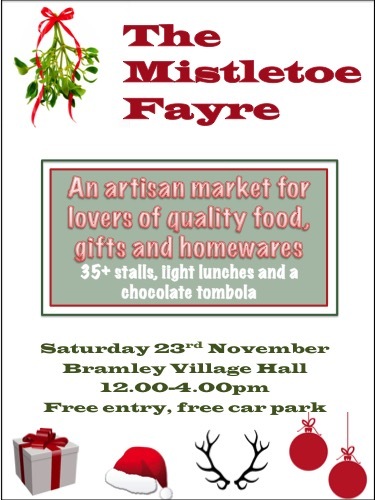 This year the Mistletoe Fayre is on 23rd November in Bramley Village Hall from 12.00-4.00pm. We have a slightly new look to our event this year with a new range of stalls offering truly unique gifts for the home, for friends, for family and even the family pets! We are still showcasing the best of what some of our local producers of home made products have to offer but as well as these we are including some complementary non-craft items that we know you will really love. Put it in your diary, tell your friends and come and enjoy all that we have to offer at this year’s Mistletoe Fayre. Free entry, free parking and light lunches also available.